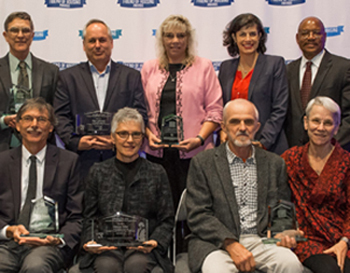 Congratulations to our 2018 Friend of Housing and Margaret Sevy Award winners! Read more about these amazing leaders here. Back: John Harmon, Paul Lambros, Melodie Pazold, Rep. Nicole Macri, Andrew Lofton. Front: Arthur Sullivan, Melora Hiller, Douglas Hobkirk, Alice Quaintaince. Photo by Alec Miller. 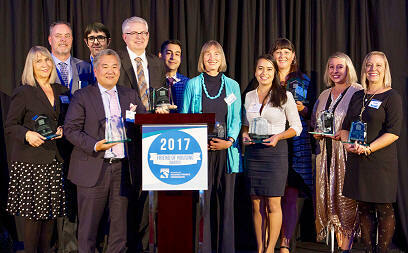 Read about the 2017 Friend of Housing Award winners: Dianne Wasson; Doug Ito of SMR Architects; Marty Kooistra; Deborah Winter; Madeline Cavazos (for Rep. McBride); Pamela Tietz; Jennifer Staplin; Alison Dean. Photo: Alec Miller. For more information about the Friend of Housing Award, please contact Margret Graham at margret.graham@wshfc.org.